"I just got an email from GDWS that you are no longer a demo. What happened?" "What else did the email say?" Gina responded, "Nothing. It's just a form notice they send whenever someone joins or drops. What happened? I thought you were going to stay a demo forever!" "Well," I said, "I got tired of all the workshops. Cutting cardstock, rounding up hostesses, etc. It ended up being way too much work. I don't think people realize how hard it is to be a demo. I mean, I loved it, but with the kids and all, I decided this isn't my time." "Really?" Gina said. "I'm so surprised. I guess I'll recommend some other demos when I resign. Well, you have to do what is best for your family. But, I think you have a knack for sales. I hope you go back to it someday." Gina was right. I did have a knack for sales. I was only a demo for a few months, but I now had 5 thousand dollars in my own craft account. I had earned it fair and square working my tail off at those workshops. Sure, I spent a lot on those workshops, but with the tax breaks, I had come out ahead. "Gina, I'd just like to thank you. If it wasn't for you, I'd never have heard of stamping." "Oh that's so sweet of you to say. So, you're going to keep stamping?" "Absolutely. I love it! But I'm going to be very careful how I spend my money. I've sold some of my GDWS stuff, and am going slow in buying more things. In fact, I'm trying to learn as much as I can before I get really into it. I was so busy selling stamps that I never took the time to really learn all about stamping. And, seriously, there is a lot to learn. Speaking of which, can I ask you a question?" "My mother in law told me that the birthday card I sent to her fell apart after a couple of days! The layers just separated. I was so embarrassed. What kind of glue should I use?" 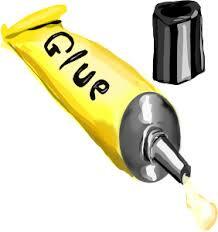 Gina laughed, and said, "First of all, we don't say glue. In the stamping world, we refer to adhesives. Glue sounds too much like kindergarten." "Oh, thanks for letting me know. That's what I like about you. You know so much! So, what gives on the adhesive I used?" Gina replied, "To be honest, the topic of adhesives is very controversial. I lost a friend over it! She just wouldn't stop using one of those kiddie glue sticks and it was so embarrassing to stamp with her. Now some folks swear by Scotch double sided tape. But, I'm not a fan. It just isn't that strong. I use an ATG." "Well, ATG stands for Advance Tape Glider. It is a big plastic holder with two rollers and you insert a ginormous a roll of super strong tape in it. It lasts forever and your layers will not separate. And, it comes in Precious Pink!" "Ooh, sounds crazy amazing! Is it hard to use?" "Not at all. It's very easy to insert the tapes. They never tangle -- I've never heard of anyone having a problem with it." "Wow," I said, "That sounds great. I have to get one." "Well, wait a Minty Minute. Some folks prefer a liquid adhesive and swear by Tombow Mono Multi in the green cap. It is permanent when you press the layers together, but if you just let it air dry, it's temporary. It takes up a lot less space than an ATG. But no matter what adhesive you use for card layers, you MUST get some liner tape. It is super strong and perfect when making 3D items like boxes. And glue dots. Oh my, how can I forget glue dots? They can really come in handy when adhering small items." I was surprised at how many choices there were just to stick stuff on paper. "This is all fantastic, Gina. I may get that ATG thing, and the liner tape, and the glue dots." This was beginning to add up and it was just adhesives. Gina was quiet for a minute and then said, "Listen, before you shell out any money for any adhesive, I'm going to tell you something, but you can't tell a soul, ok?" Hmm...nothing better than a crafty secret! "Absolutely, Gina. What's the big secret?" "There's a new machine coming out next month that is going to revolutionize the crafting industry. My friend invented the MAN!" "It stands for Multiple Adhesives Now." "What's so special about it?" Gina responded, "It's the first machine ever to apply adhesive automatically! Here's how it works. You plug it in. There are two platforms on the left side, an upper and lower. Place your bottom cardstock layer on the lower platform. There's a grid on the platform and you put your cardstock on the grid exactly where it would fit on an A2 card. Then do the same for the top layer, making sure that the top of the layer is face up. Select the type of adhesive you want, liquid or tape or dimensional, and then turn on the MAN. The layers go through the machine, adhesive is applied, and the layers of your card will come out at the end in perfect placement and solidly adhered. It's the most incredible stamping machine ever!!! And, it's small -- only about the size of a large toaster oven." "Oh. EM. Gee! Wow, Gina, that does sound incredible. And all you have to do is turn on the MAN and you are done?" "Yup. You just turn on your MAN and get a perfect outcome every time! And the best part? It's only $299 and comes in two fantastic colors -- Totally Tanned or Marvelous Mustard." I had to have one. And I had to be one of the first to have one. If I wanted to become a leader in the stamping industry, I had to get the latest products asap, right? "When will it be out? How do I get one?" "It should be out by May, and pre orders start in March. She's only selling them online for now, but hopes to get into Michaels or Hobby Lobby sometime later this year." "Oh Gina, you're the best! I'm definitely getting one!" So I preordered a Totally Tan MAN. I couldn't wait to turn it on! It only cost $325 with shipping and handling. And the best part? I still had plenty of money left in my account to become a top notch stamper! The MAN - I want one of those, too! 'You just turn on your MAN and get a perfect outcome every time" - if ONLY! LOL! This had me laughing out loud!! i hope there are really good instructions for turning on the MAN!! Hey Joan, another fun chapter in SDML. One thing though, something weird is going on. I see next chapter... And then some spaces and more story appears. It looks like it belongs with the current chapter but not quite. I am guessing it was a copy and paste mistake! thank you Julia!!! That was a piece of the story that should have been deleted before I pressed published. It didn't make the final cut. I'm not feeling well today and pressed published without doing a final check. Not a good excuse but the best I've got! I feel like I got to see behind the curtain! Feel better soon! I have a song going through my head...."what a MAN, what a MAN..." :) So many choices, so little time. I want to yell out "No, M, don't go down into that cobwebby basement in the haunted house, all by yourself with no flashlight! No, no, don't!" ooooh, a man in the craft room never turns out well....except for Tim! Just when I thought it was all over (and I was sad), out comes another hysterical post! Thank you for the entertainment! OMG, this is the best chapter yet, lmao, Totally Tan MAN, bwahahaha!!! After reading this latest chapter, I counted up my glue...ahem, adhesives and found to my utter chagrin 21 different kinds and that didn't include my Ranger Multi Medium Matte. Yup, I'm well put together, huh? I know!!! Nothing in this story requires much of an imagination! Hahahahahaha! As Gina was describing the MAN I was sitting here laughing out loud. Rich had to turn around to see what was so funny. I'm still laughing. I can't stop! When I saw the glue picture in my Bloglovin' I thought maybe M had turned to sniffing the stuff. You sure can tell this was written by a stamper. They do say "write what you know". Well, you nailed it!